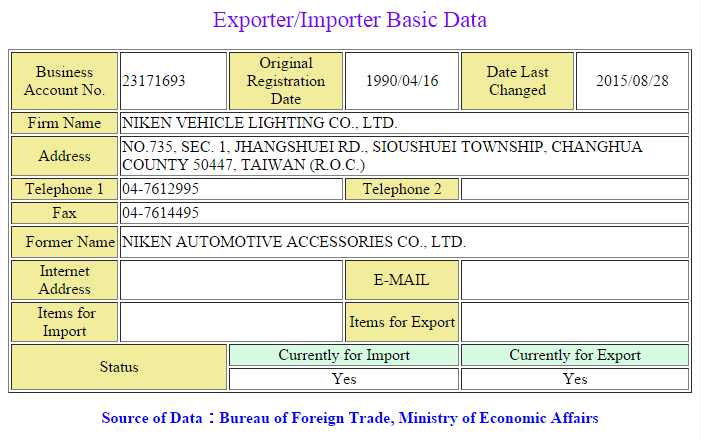 We, NIKEN Vehicle Lighting Co., Ltd, were established in 1976 as a professional manufacturer, exporter, OEM & ODM of car tuning in Taiwan for nearly 40 years. We achieved ISO9001 quality assurance certificate in 2001, SA8000 Social Accountability certificate in 2010 and our product also passed many international certificates, such as E-mark, CE, RoHS and FCC. We have the best sales group, professional R&D department for LED auto/motorcycle LED lamp and accessories and experienced manufacture factory. Niken is also one of T2 suppliers of Toyota and Subaru and continuously develops a series of LED Lamps, USB Car Adapter and specific car chrome style accessories to meet consumer’s requirements. Besides developing our NIKEN product series, we constantly make efforts for all friends who need LED lamp or interest in the field in order to provide the professional service and create the best value for each other. For the past years, we have designed and manufactured many kinds of auto accessories, even led the fashion trend of the field. Every stage, we focus on different core products and get a good positive response from our clients. Do you want some cool stuff to make up your car to be fashionable and specific? NIKEN is your best choice! Due to the product category expanded, the name of NIKEN automotive accessories has been changed to NIKEN VEHICLE LIGHTING CO. LTD since 2015, Oct.
We focused on the 3rd Brake LED Lights and LED reading lamps that were also passed e-mark approvals. Besides, we also designed and manufactured a series of Pedal Pads and Gearshift Knobs that led the fashion and created a great sell in the Western Europe and the Northern America, and hereafter we built our NIKEN brand awareness. We promoted our NIKEN brand worldwide. Furthermore, we continuously developed a series of LED Lamps, USB Car Adapter, digital applications and specific car chrome style accessories to meet consumer’s requirements. Besides, we also cooperated with many worldwide famous companies in OEM/ODM products. To avoid the copy and low-price competition of general car accessories from Mainland China, we will devote our core business to developing LED Lamps and its applications continuously. Except developing our NIKEN product series, we will constantly make efforts to serve many of our existing and new customers well and to create maximum value for them. In order to supply the best product and quality service, except our current head office and factory, we will increase more professional machinery equipments and will plan to build a new factory. It is always the best power for us from our valued customers’ trust and support. Expecting the future, facing the challenge, we will continuously create and own the market advantageous position, and expect to be the best partner of our customers forever.